You are currently browsing the tag archive for the ‘ICE’ tag. If we’re ever wondering how and when we transformed into a society supporting a Prison Industrial Complex, then we can and should look to events in Karnes County, Texas this week. Playing out in Karnes Co. this week is a scene that we’ve seen thousands of times before. And ultimately, we’ll see a decision to build or not to build. For every one of the 6,000+ prisons in America (Federal penitentiaries, State prisons, County Jails, private prisons and ICE detention facilities) there has been a process of planning, discussion, budgeting and approval. The degree to which these political mechanics are visible and accessible to the public and the degrees to which public are aware or activated for and against prison in their earliest proposal stages, of course, differs wildly. But, I want to make the point here that prisons don’t simply emerge as a natural consequence of crime. Prisons are buildings with construction and operating costs. Prisons are places of labor and sites of capital. Prisons are designed and they are manufactured by men who want to assume some type of responsibility for them. I argue that GEO’s motive, in Karnes Co., for assuming the responsibility of an expand family detention facility is profit. This autumn, GEO Group stock hit a 52-week high. The GEO Group, a corporation with a long history of poorly-run facilities and abuse of prisoners on its watch stands to benefit most from the proposed expansion of the facility from 532 women and children to more than 1,300. Watch Karnes Co. this week, because it is in its Commissioners’ offices that the absolute decision by some humans to put more humans behind chain-link and razor-wire will be made. Watch Karnes Co. this week because this is one of thousands of current battle sites in the nation, right now, in which activists are intervening and slowing or stopping our insane march toward incarceration. Watch Karnes Co. this week because those opposing the expansion are true American heroes. Watch Karnes Co. this week because not since WWII internment has the United States put so many non-criminal women and children behind bars. According to local channel KSAT, opinions are split, but in the VT those in favour were making simple arguments based upon the jobs the GEO prison would bring. Opposing views are nuanced and based in a broader and ethical perspectives. When the family prison opened in 2012, NPR did its best to distinguish it from other places by describing it as “less like prison.” Well, such a *new dawn* and such an enlightened approach to the sick practice of looking up women and children has not yielded results. 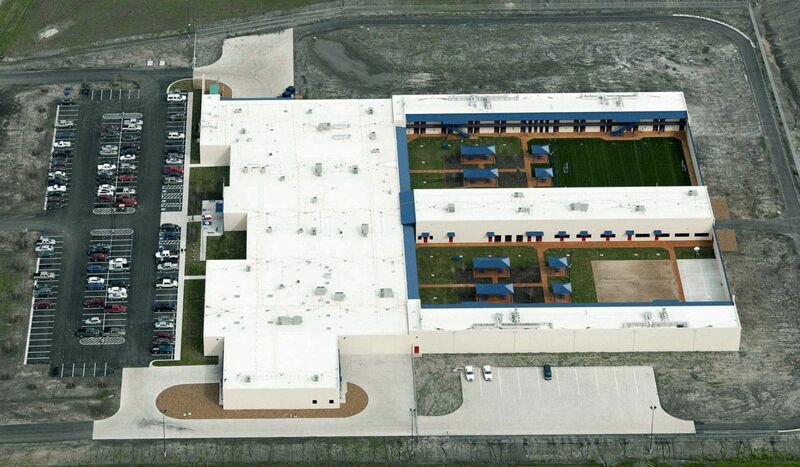 This new type of prison, apparently, leads to a bigger prison and not *a solution* to the perceived problem! Read up about the case. If you’re concerned sign the petition. Your letter will go directly to the Karnes County Commissioners. Watch a 30-minute documentary about the Karnes facility. Here’s the trailer. Again, please, sign the petition.